Starting November 13th, enter at Big Island HPM stores for your chance to win $1,000 CASH! AND since we're in the spirit of giving, an additional $1,000 will be donated to the local non-profit charity of your choice! How's that? 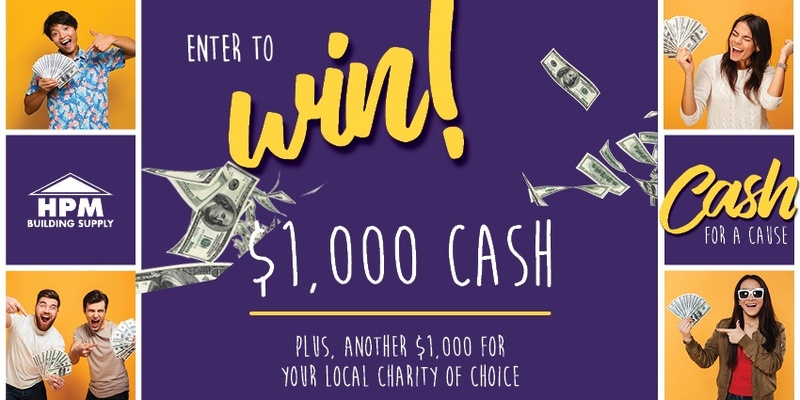 $1,000 for you and another $1,000 to help a wonderful local cause! THREE Grand Prize winners, one from each HPM store, will be announced during the week of Monday, December 17th. Pick up an entry at HPM Hilo, Kona or Waimea stores starting November 13 through December 16, 2018. Completely fill out the entry form with your first and last name, email address phone number and your local non-profit charity of choice. Please ensure your handwriting is legible. Follow us on Facebook or Instagram (@hpmhawaii) to be notified about additional opportunities to enter online. From December 1st through 12th, you can also enter on Facebook or Instagram for a chance to earn extra entries for our Cash for a Cause Giveaway! 1. Ensure your profile is set to public until the end of the contest. One entry per person, per day. Last day to submit entries will be 11:59pm on December 12, 2018. Sponsor: The Promotion is sponsored by HPM Building Supply (the “Sponsor”), 16-166 Melekahiwa Street, Keaau, Hawaii 96749. Eligibility: No purchase is necessary. HPM’s Cash for a Cause (the “Promotion”) is open only to legal Hawaii Island residents who are 18 years of age or older at time of entry. Employees and immediate family members of HPM Building Supply are not eligible to enter. The Promotion is subject to all applicable federal, state and local laws and regulations and is void where prohibited by law. Agreement to Official Rules: By participating in the Promotion, entrant fully and unconditionally agrees to and accepts these Official Rules and decisions of the Sponsor, which are final and binding in all matters related to the Promotion. The Sponsor reserves the right to change Official Rules throughout the Promotion. Promotion Period: The Promotion begins November 13, 2018. Entries must be received in Hilo, Kona and Waimea HPM stores by 4:00pm on December 16, 2018. Online Entry – Additional ways to enter will be made available through HPM’s social media platforms, Facebook and Instagram, with details to be announced in those media. Electronically produced or duplicated entry forms will be automatically disqualified. Entrant is responsible for completing the entry form (first and last name, phone number, email and charity of choice) and depositing the entry in one of the official Promotion entry boxes located at HPM’s Hilo, Kona or Waimea stores. HPM reserves the right to qualify or disqualify entries at their discretion. Prize: The Grand Prize is $1,000 cash for the winner, and $1,000 donation made to the winner’s charity of choice. One Grand Prize winner will be awarded at each HPM store in Hilo, Kona and Waimea during the week of Monday, December 17, 2018. One Grand Prize will be awarded per winner. The Winner’s Responsibilities: There are no substitutions, exchanges or transfer of prizes by winners. The winner is responsible for all taxes and fees associated with the prize receipt and/or use. The Grand Prize winner must select a Hawaii Island charity of their choice to which HPM will make the $1,000 donation. The charity must have a Hawaii Island address. Publicity: Except where prohibited, participation in the Promotion constitutes the entrant’s consent to use Grand Prize winner names, likenesses, city and state of residence for promotional purposes in any media without further consideration. General Conditions: In the event that the operation, security, or administration of the Promotion is impaired for any reason, including but not limited to, fraud, technical failures, regularly schedule maintenance, virus or other technical problem, the Sponsor may, in its sole discretion, either: a) suspend the Promotion and award the prize in a random drawing from among all eligible entries received up to the time of the impairment. The Sponsor reserves the right in its sole discretion to disqualify any individual it finds to be tampering with the entry process or the operation of the Promotion or to be acting in violation of the Official Rules, or in an unsportsmanlike or disruptive manner. Any attempt by any person to undermine the legitimate operation of the Promotion may be a violation of criminal and civil law, and should such at attempt be made, the Sponsor reserves the right to seek damages from any such person to the fullest extent permitted by law. The Sponsor’s failure to enforce any term of these Official Rules shall not constitute a waiver of that provision. Release and Limitations of Liability: Except where prohibited, by participating in the Promotion, entrants agree to release and hold harmless HPM Building Supply, and their affiliates, promotional partners, prize partners, agents and agencies and the officers, directors and employees of each of them (the “Released Parties”) from and against any claim or cause of action arising out of the participation in the Promotion or receipt or use of any prize but not limited to: a) unauthorized human intervention in the Promotion; b) technical errors related to the computers, servers, providers, printers or telephone network lines; c) printing errors; d) errors of the administration or the processing of entries; e) late, lost or undeliverable mail; or f) injury or damage to persons or property which may be caused, directly or indirectly, in whole or in part, from the entrant’s participation in the Promotion or receipt of any prize. Entrant further agrees that in any cause of action, the Released Parties’ liability will be limited to the cost of entering and participating I the Promotion and in no event shall the Released Parties’ be liable for attorney’s fees. Entrant waives the right to claim any damages whatsoever, including but not limited to, punitive, consequential, direct or indirect damages. If for any reason an entrant’s entry is confirmed to have been erroneously deleted, lost or otherwise destroyed or corrupted, entrant’s sole remedy is another entry form. Disputes: Entrant agrees that: a) any and all disputes, claims and causes of action arising out of or connected with this Promotion or any prizes awarded shall be resolved individually, without resort to any form of class action, and exclusively by the United States Hawaii County Court of the Island of Hawaii or the appropriate Hawaii State Court located in Hawaii Island County, Hawaii; b) any and all claims, judgements and awards shall be limited to actual out-of-pocket costs incurred, including costs associated with entering the Promotion, but in no event attorney’s fees. All issues and questions concerning the construction, validity, interpretation and enforcement of these Official Rules, or the rights and obligations of the entrant and Sponsor in connection with the Promotion, shall be governed by, and construed in accordance with, the laws of the State of Hawaii, without giving effect to any choice of law rules (whether of the State of Hawaii or any other jurisdiction), which would cause the application of the laws of any jurisdiction other than the State of Hawaii. Entrant’s Personal Information: Information collected from entrants will be kept confidential to the Sponsor.